Fact about chess, checkmate and king. Interesting fact about chess, checkmate & king. 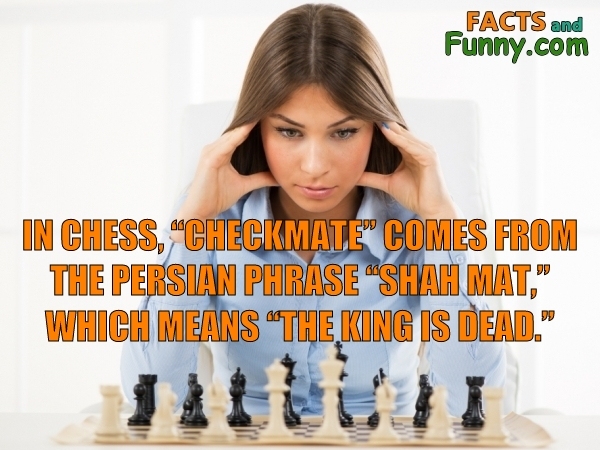 In Chess, Checkmate comes from the Persian phrase Shah Mat, which means The King is dead. We find this fact interesting because we don't think the origin of the word "checkmate" is well-known. In addition to chess, this photo shows chess pieces, woman and concentration. The number of possible unique chess games is much greater than the number of electrons in the universe. This content was created in January 2019.